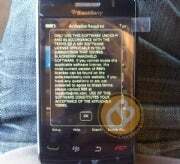 This image is one of many reportedly depicting the next-gen Balckberry Storm. The images come from Crackberry.com. Photos alleged to be the Blackberry Storm 2 surfaced online Thursday on the site Crackberry. While the images are new, they don't provide a lot to get excited about. The supposed images of the next-gen Storm appear to reduce any high hopes of what the actual Storm 2 might deliver. Here is what many are concluding after seeing the images posted by Crackberry: It sports Wi-Fi, a noticeably absent feature on the original Storm. A rumored 5MP camera is absent; instead, the image of the device has the same 3.2-megapixel camera as the original Storm. It also appears the bottom four buttons of the supposed Storm 2 are the same as the original, except now they appear to be part of the touchscreen. The photos also don't show the operating system, giving us no way to know what the user interface will look like. There's also no way to know if RIM has kept its oft-maligned SurePress touchscreen that tried to merge touch capabilities with a physical keyboard. Although, considering the poor reception SurePress received, I wouldn't be surprised to see it go. The device in the photos is slightly thinner than the Storm, and many are saying the new phone is faster and less software glitches than its predecessor. However, there's no way to know that for sure. While the device in the photos looks real enough, it's hard to know if this is the real thing. So far, RIM has been quiet about the possibility of a new Storm, but if the rumors are to be believed we could see the Storm 2 as early as September. Several other devices are rumored to be coming from RIM this year, including two separate devices codenamed Onyx and Gemini. The original Blackberry Storm was one of many devices designed to be the yet-to-surface iPhone killer -- a single device that could draw as much tech lust as Apple's eye-popping device. However, many critics were not bowled over by the device, including PC World's Yardena Arar, who called the device a "failed experiment." The Storm's most vocal critic was David Pogue, tech columnist for The New York Times. Pogue called the original Storm a "dud" and said he hadn't "found a soul who tried [the Storm] who wasn't appalled, baffled or both." Criticism of the Storm set off a flurry of consumer indignation with fans rushing to defend their beloved Blackberry brand. Despite those bad reviews, the Storm is part of a RIM lineup that dominated the U.S. market during the first quarter of 2009. The Storm was the third most popular device in the United States for the first part of 2009, according to NPD group. The Storm's sibling the Curve won the top spot, while the Blackberry Pearl came in fourth behind the Storm. Apple's iPhone snagged second place and the Android-based T-Mobile G1 rounded out the top 5. To view all the images of the alleged Blackberry Storm 2 visit the site Crackberry.